“Erected to the Glory of God, and in Loving Memory of the men of this Parish who gave their lives for God and Country.? ?Honour and Deepest gratitude to all who fought in the Great War, 1914-1918.? These sentences on the Walkern War Memorial were the keynote of the service ? reverence, honour and gratitude ? at the unveiling, which took place on Sunday in memory of the 30 men of the parish who gave their lives in the great struggle for freedom, 1914-1918. The proceedings commenced with a procession of the 1st Herts Territorial Band under Bandmaster Sergt. Nash, followed by a number of local ex-service men, the choir of the Parish church, and the school children. These formed two sides of a triangle to the memorial, while relatives of the fallen formed the other. The hymn ?On the Resurrection Morning? was accompanied by the Band. The Rector, the Rev WE Mills MA, in his address, reminded his hearers that they were gathered to do honour to the fallen who had died on the Cross of Sacrifice, and that it was right their memorial should be in the form of a Cross as a symbol of the great sacrifice they made; that their memorial was in one of the most lasting forms of stone itself as near imperishable as things could be in this constantly changing world. The men who went, expected, and were promised, a better world, but up to now their expectations had not materialized. If his hearers would register a solemn vow to try and do their best, to give more and expect less, then at least one spot of this England of ours would be better and brighter. 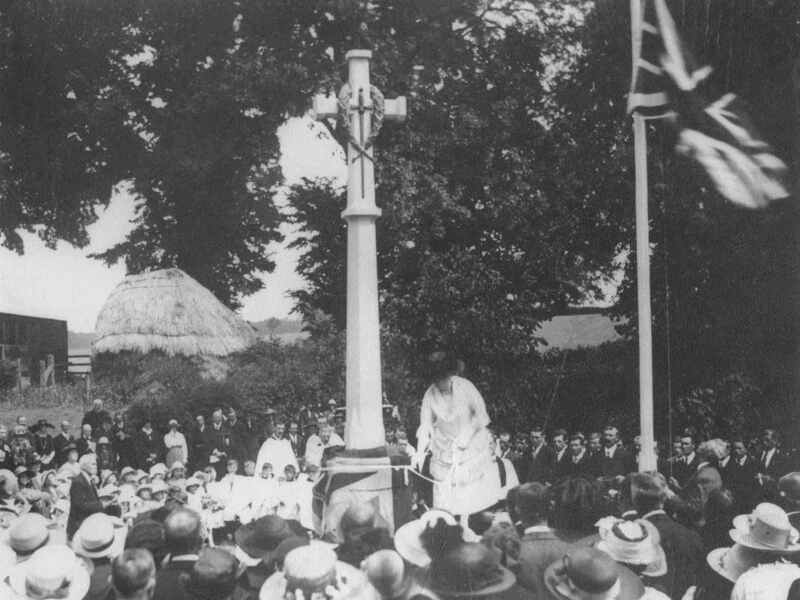 The Memorial Cross was then unveiled by Miss Cotton-Browne. The ?Last Post? was sounded by Bandmaster Sergt. Nash and Sergt-Instructor Carpenter. The Rector then dedicated the memorial in words most impressive. The hymn ?When I survey the wondrous Cross? was sung during which a large number of floral tributes were placed on the memorial. The Rev TA Pye MA, LLM, read the lesson from Joshua iv, 1-8, 20-24. In the course ofa most inspiring address he told those present that life was not a matter of years, but of deeds, that the most wonderful life ever lived, that of Jesus Christ Himself, only lasted 33 years. During that period He uttered the most profound truths and did the noblest actions any man ever has done. The hymn ?The Supreme Sacrifice? was then sung, the Rector gave the Blessing, ?Reveille? was sounded by the buglers, and the band played the National Anthem. This concluded the service. The Memorial is a handsome Cross in Forest of Dean stone, with a bronze wreathe and sword at the top, and reflects great credit on the architect, Captain Wilson of Victoria Street, London, and to the craftsmanship of Mr G Preston of Benington, to whom the work of erecting the Cross was entrusted. Thinking of my Uncle, Stanley Harold Sheppard, of Walkernbury Farm, who is honoured on your memorial. Also remembering my late Father, Frank Sheppard and Uncle, Donald Sheppard, who survived their time as POWs with the Japanese. Thank you so much for the most valuable and interesting information produced by your Society. I have reason to believe that I am related to Walter and Alfred Savage who fell during WW1, according to the list of Walkern War Memorial names on your web site. I am currently researching my family tree and would welcome any correspondence/information from members of ‘The Walkern Savage family’ if any are still in residence in your village or indeed from any source. I also have a question regarding Alfred Savage, Pte M349525, that perhaps you can assist with. The typed graves registration report form (original document?) on the CWGC (WW1 Casualty Details) web site states that Alfred died 25th Feb 2018 (subsequently amended by hand to 25th Feb 2019). So did Alfred die in 1918 or 1919? If it was 1919, was it from a war induced illness/injury resulting in the remark on the report ‘died from influenza whilst on active service’. If it was 1918 was it in battle and if so where did he die? Kind Regards, Jim. Hi my name is Racheal savage, I am the direct descendent of walter and fred, they are my great great great uncles. My Children are the last of the savage line so far. I would love to talk to you and share information with you about this.